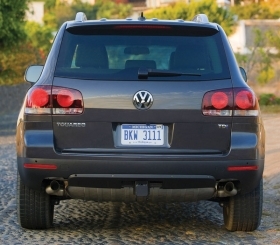 VW brews coffee with a filter that spent time on a Touareg tailpipe. Freezing a Volkswagen Golf TDI diesel to 25 degrees below zero to prove it will start in cold weather? Brewing coffee with a filter that spent 10 minutes on the tailpipe of a Touareg diesel SUV? They're both videos on VW's new uncensored blog TDI Truth & Dare, tditruthanddare.com, created to promote clean diesel. The blog was launched May 4. Research shows consumers still think diesels are "smelly, smoky, bad for the environment and don't start in the cold," said Charlie Taylor, general manager of digital marketing and motor sport for Volkswagen of America. So VW decided to create a Web site on which it could post videos and other information about diesels, and also let consumers speak to each other. "We are not interested in a faux blog," Taylor said. The site also has a diesel tracker that locates service stations that sell diesel fuel by ZIP code, also giving the price per gallon and directions. In addition to the Jetta and Jetta SportWagen diesels, VW introduced a Tourareg SUV diesel last month and will introduce a diesel in the new Golf this fall. Volkswagen has sold 8,010 clean diesel vehicles this year.